Hello! This month's post For the Kids is all about "Wild Time". I first read about Project Wild Thing on Lori's Wild & Grizzly blog in January (check out the post here) It really resonated with me because as a parent I do worry about the amount of time Wiss spends in the great outdoors. We are really careful to monitor his screen time, and as he's only 4 it's quite easy at the moment, but I want to make sure he experiences that there's more fun things 'out there'. I bought the dvd straight away so I could watch the documentary at home - it is brilliant! It's funny, and all too familiar, and actually desperately sad too: "children in the UK spend less than 5% of their time outdoors". Wow. If you'd like to see the film for yourself then check out the website. You can see it in cinemas, buy the dvd or even request a screening for your group. This weekend Wiss and I headed out to Bradfield Woods in Suffolk with Nana Daisy. It was a beautiful day so we packed sandwiches and drew up a list of things that we hoped we could spot while we were exploring. You can see the list below... The dog poo was at Wiss's insistence I'm afraid! When we got there we discovered that Suffolk Wildlife Trust actually have a wonderful visitors hut, staffed by volunteers, where you could have a cup of tea, find out more about the woods and their conservation projects and they even had an 'Explorer's Pack" for kids to borrow. 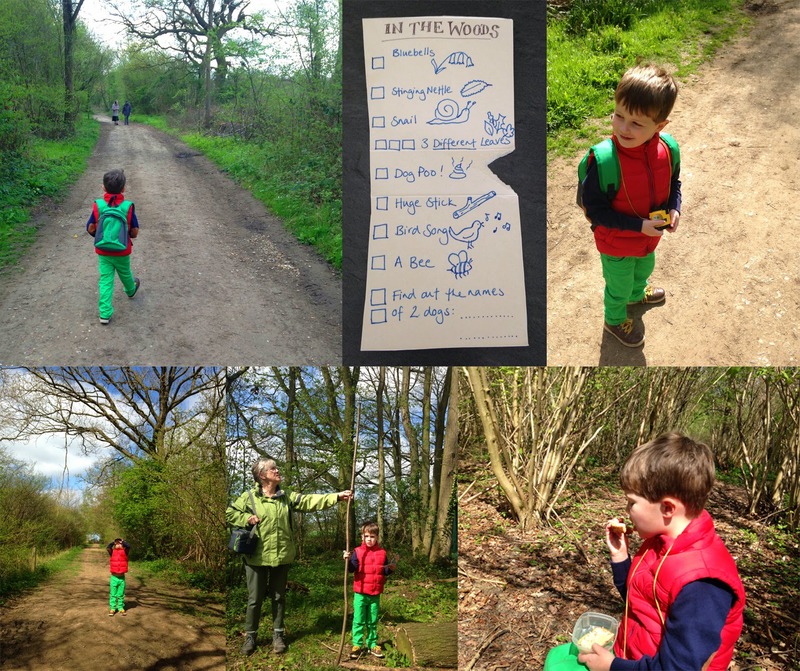 The green rucksack (which matched his outfit perfectly) was filled with similar laminated lists of things to to look out for and pictures of the Spring flowers we may spot, as well as binoculars, a magnifying glass and a bug pot. 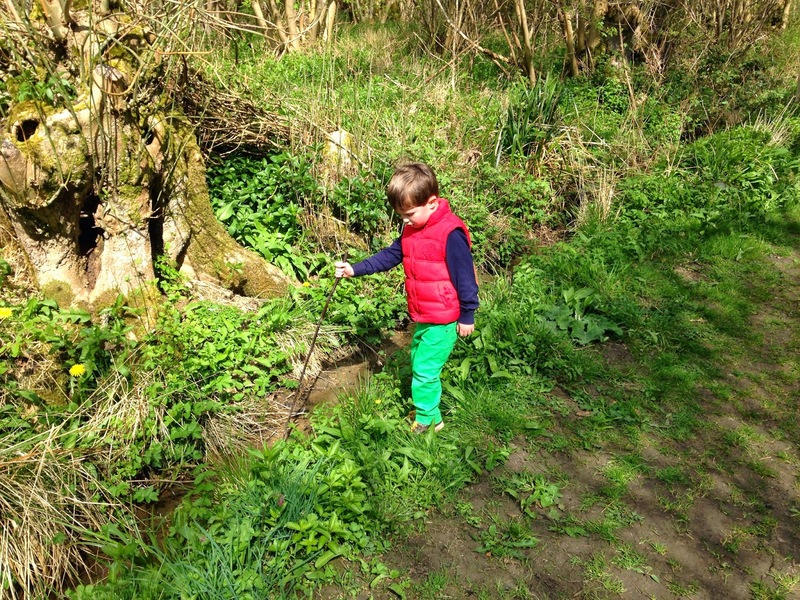 Wiss loved these three items and marched off into the woods to put them to the test! At first he was in a hurry to check things off our list as soon as possible, but it was great to see him gradually forget about it as he was busy looking and he started exploring at his own pace. There was lots of hunting small creatures, listening to the different bird songs and poking sticks into muddy puddles to see which was the deepest! We spent a few hours in the woods and it was wonderful for all of us, plus we managed to tick everything off the list apart from the snail! Even if you're in a city (which we usually are) there are lots of ways you can still enjoy Wild Time - just get outdoors and see what happens! 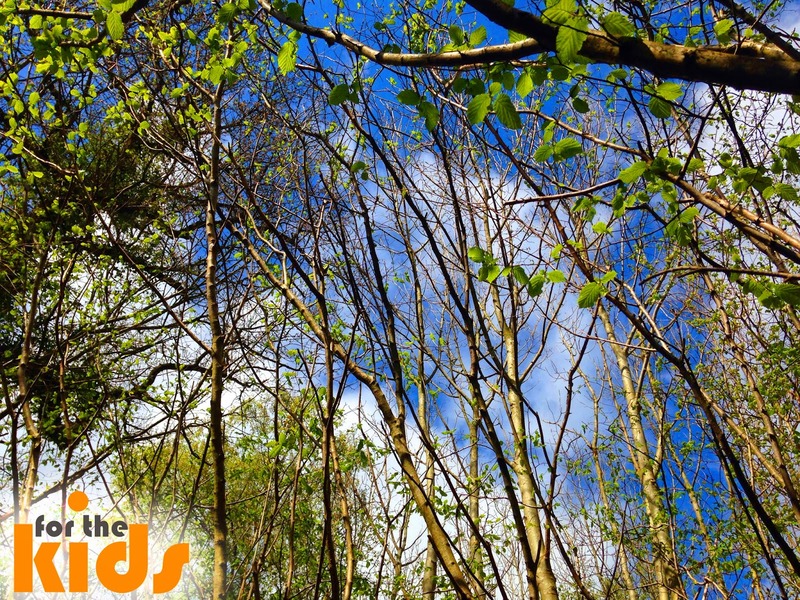 There is a fab and free Wild Time app which can provide inspiration if you get stuck, and you can even get ideas for as little as 10 minutes up to activities to take half a day. We have a long Easter bank holiday coming up in the UK, why not pledge to swap some screen time for wild time this weekend and see what you and your kids can get up to? Please share your adventures by either leaving a comment or link below or if you're on twitter you can use #wildtime to link up.